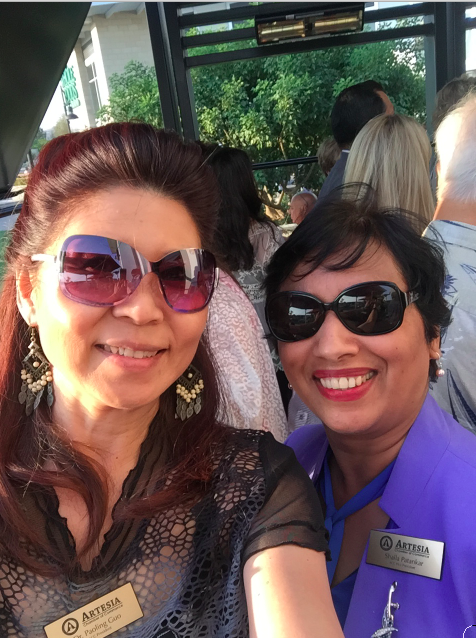 Enjoying the great food and friends at the Chamber Business Alliance Mixer were Artesia Chamber of Commerce President Dr. PaoLing Guo and Vice-President Shaila Patankar. The Artesia Chamber of Commerce Executive Board attended a Chamber Business Alliance Mixer in Brea Aug. 25 at Jimmy’s Famous American Tavern where they extended their marketing reach out and networking skills with five other Chambers. La Habra Chamber of Commerce President / CEO Mark Sturdevant welcomed more than 100 Chamber members who enjoyed a delicious menu of barbecued delicacies such as meatballs and ribs while making new contacts. The Chamber Business Alliance (CBA) is a group of six Chambers that have agreed to welcome members from other CBA Chambers to attend selected events displaying the CBA welcome logo. They believe all will benefit by cooperating with one another and welcoming business-minded people.